In this article we will compare the ILIFE V-series vacuuming & mopping robots V3s Pro, V5s Pro, V7s Pro and V8s. 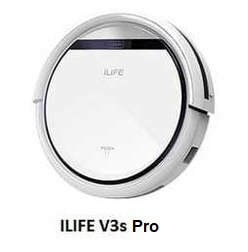 If you'd rather see a comparison of ILIFE A-series vacuuming robots, please click: ILIFE A-Series Vacuuming Robots. 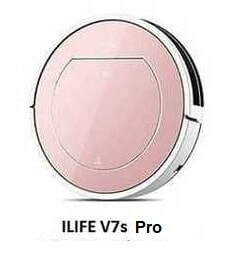 ​ILIFE was founded in 2007 and has been developing robotic vacuum cleaners ever since. With a strong R&D team, ILIFE developed numerous patented technologies in the robotic vacuum industry, serving as one of China’s leading enterprises in the robotic vacuum domain, from R&D support to extensive manufacturing capability. All ILIFE products are assured to pass high quality control and acquire the international FCC, CE and RoHS Certifications. CE: European Conformity Certification that indicates that the product complies with all relevant European requirements. This article will compare the ILIFE V3s Pro, ILIFE V5s Pro, ILIFE V7s Pro and ILIFE V8s robots. ​The following table compares the ILIFE V3s Pro, ILIFE V5s Pro, ILIFE V7s Pro and ILIFE V8s robots​. Note that robots that are not equipped with a main rolling brush (such as ILIFE V3s Pro and V5s Pro), and that use direct suction, are best for cleaning hard floors and collecting pet hair. However, because ILIFE robots have enough suction power (600pa and up), they can also be used quite adequately to clean low pile carpets. In particular, with ILIFE V5s and V8s, the Max clean mode can be invoked while working on carpets to further increase the suction power. When the dustbin is installed, V5s Pro, V7s Pro and V8s simply vacuum the floors, but when the water tank is installed, they wet mop. So for wet mopping, all you have to do is swap the dustbin for the water tank, and the robot will automatically go to mopping mode, when you press the default cleaning button. For wet mopping, the included microfiber mopping cloth need to be attached to the lower area of the robot. The microfiber cloth removes stains and dirt and won't damage the floor. 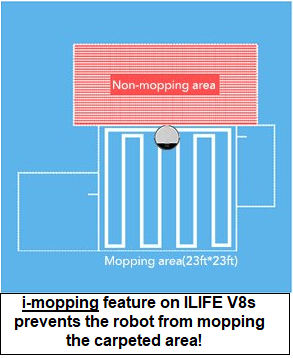 On previous ILIFE mopping robots, wet mopping was achieved using a simple gravity drip water tank. Now, the water tank module that is on V5s Pro, V7s Pro and V8s features the ILIFE "i-Dropping" system which houses an actual pump, giving it greater control over the amount of water released during mopping. So, rather than blindly dripping water all the time by gravity, the new system ensures that water only gets released when the robot is moving, minimizing water consumption as well as accidental spills. The water tank stops dispensing water as soon as the robot stops moving. The existance of the bristle main brush on V7s Pro makes this robot quite suitable for cleaning low pile carpets as the rolling brush can achieve thorough cleaning deep into the carpet. However, as mentioned, above, because the other three robots considered here have considerable suction power, they can also be used on low pile carpets to remove dust, dirt and allergens. 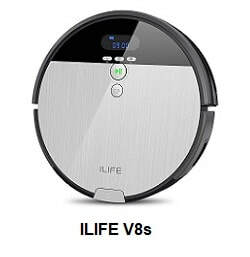 ​The self-adjusting anti-tangle suction mouth on ILIFE V8s effectively improves the cleaning performance when picking up pet hair on hard floors. All four ILIFE robots considered here automatically dock and recharge, and they are always ready to clean. The charging dock needs to be in an open area with no foreign objects within 40 inches from its sides and 120 inches from its front. The power switch on the side of the robot needs to be ON while charging. A full suit of infrared cliff sensors keep all ILIFE robots from falling off stairs. These sensors are located on the bottom front of the robot. All four ILIFE robots considered here can be activated in auto mode by pressing the "clean" button on the robot itself or on the remote-control device. In auto mode, these robots adjust their cleaning behaviour based on the worked required to do the job. 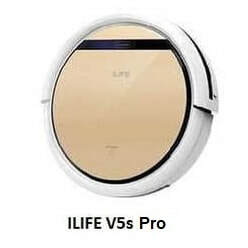 More precisely, ILIFE V3s Pro, V5s Pro and V7s Pro will go in random directions cleaning thoroughly the place, changing direction when detecting obstacles or stairs, until they sense that that the battery is low and go to the docking station to recharge. On the other hand, ILIFE V8s is supposed to be smarter than the previous robots. It features the smart planned cleaning system which allows systematic zoning and route planning for improved cleaning effectiveness. When you select the path clean mode, instead of going in random directions, the robot navigates across the floor with back and forth movements, until all the floor is covered or the battery gets sufficiently low for it to head to the charging station. Note that path mode is only available on ILIFE V8s. As mentioned in Note 9, when path clean mode is selected, ILIFE V8s navigates carefully across the floor with back and forth movements, until all the floor is covered or the battery gets sufficiently low for it to head for the charging station. Note that Path mode is only available on V8s. Path mode can be invoked by pressing the path clean button on the V8s robot or by using the remote-control device. All four ILIFE robots considered here can be asked to do a spot clean for very dirty places. Spot clean mode easily handles floors with localized heavy dirt or hair. For ILIFE V3s Pro, V5sPro and V7s Pro, spot cleaning can be invoked from the remote-control device. For ILIFE V8s, spot cleaning can be invoked by pressing the spot clean button on the robot itself or by using the remote-control device. All four ILIFE robots considered here can be asked to do an edge clean which makes the robot clean along walls and corners. Edge cleaning is invoked from the remote-control device. With ILIFE V5s Pro and V8s, the suction power can be increased by selecting the max clean mode to enjoy a super-powered clean with maximum pickup. Max mode cleaning can be invoked using the remote-control device. All four ILIFE robots considered here can be scheduled to clean your home automatically every day, at a specific time, even if nobody is at home. Once the robot is scheduled to clean at a certain time, the robot will leave the docking station and start working at the scheduled time. Note that with ILIFE V8s, you can do multi-task scheduling, meaning that you can schedule the robot to run at different times on different days of the week, whereas with ILIFE V3s Pro, V5s Pro and V7s Pro, the robot can only be scheduled to run at the same time every day. Note also that, with ILIFE V8s, scheduling can be both done on the robot itself or by using the remote control device, whereas with ILIFE V3s Pro, V5s Pro and V7s Pro, you must use the remote-control device to schedule. All four ILIFE robots considered here come with a remote-control device that can be used to schedule the robot, to invoke the various run modes, such as auto clean, spot clean and edge clean, and to send the robot to home base to dock and recharge. Note that with ILIFE V8s, operations such as scheduling, spot clean and path clean can also be invoked from the robot itself by pressing the appropriate button. All four ILIFE robots considered here are equipped with a primary filter and a HEPA style filter. All four robots considered here are equipped with a 2600mAh high capacity rechargeable Lithium-Ion battery that delivers performance during cleaning. The fade-free technology used in these batteries ensures a steady and lasting battery life. The run time for these batteries after a full charge can vary anywhere from 90 minutes to 120 minutes, depending on the amount of work the robot has to do. Note that the amount of work the robot has to do depends on many variables such as the cleaned area size and shape, furniture and other objects present in the area cleaned, floor and carpet type as well as the amount of dirt and hair to be picked up. ​Note that an adapter is also provided with each robot for manual charging. All four ILIFE considered here are equipped with roadrover wheels with self-rescue technology. Thanks to the extra large stabilizing wheels, these robots can ride over obstacles and travel across different rooms allowing the robot to cross doorsills or transition effortlessly onto the low pile carpet during operation. Of the four robots considered here, only ILIFE V8s has a small LCD screen on the robot itself that keeps you informed with simple icons of the various states the robot may be in, and that can also be used for scheduling using the appropriate buttons on the robot. ​The other three robots considered here (V3s Pro, V5s Pro and V7s Pro) have only a single CLEAN button on the robot cover. All other functions, such as scheduling and mode selection, are done using their remote-control device. ​So which of the four ILIFE robots is best for your home's cleaning needs? If you just have hard floors, you might want to consider ILIFE V3s Pro, ILIFE V5s Pro or ILIFE V8s to keep your home clean. These robots use direct suction (no central rolling brush) which is great to clean hard floors and pet hair, with no tangles. But note that ILIFE V5s Pro and ILIFE V8s can also do wet mopping, while ILIFE V3s Pro does not. If you have low pile carpets and hard floors, you might want to consider either ILIFE V5s Pro, ILIFE V7s Pro or ILIFE V8s. Even though V5s Pro and ILIFE V8s do not have a central rolling brush, using the Max mode, the suction power of these robots can be increased to a level that makes them quite effective for cleaning low pile carpets as well. ​It has a self-adjusting suction mouth which improves considerably the cleaning performance when picking up pet hair on hard floors. It has the additional path clean mode which enables the robot to navigate more intelligently across the floor, using back and forth movements. It has the i-mopping feature that prevents the robot from going on carpets when in mopping mode. It is the only one of the four with an LCD screen and various control buttons on the robot itself. So, it can be controlled and scheduled both from the robot itself and using its remote-control device.